Niche construction is a biological process whereby organisms modify the conditions and resources of their environment to create heritable niches for themselves and their offspring. For example, Beavers build dams which influence river flow and lake formation, creating a niche that changes plant composition and decomposition dynamics in the immediate area of the dam. In the standard view of evolution, the gene is the main unit of selection in evolving populations of phenotypes. Species develop adaptations to their environment and the responsible alleles proliferate in the gene pool. From a niche construction perspective, organisms modify their environment – and possibly that of other species – creating a heritable environment for offspring. Advocates of niche construction argue that this forms an important feedback process in the natural evolutionary process. This work is part of a series of experiments where we have applied biologically inspired processes to the development of creative generative systems. 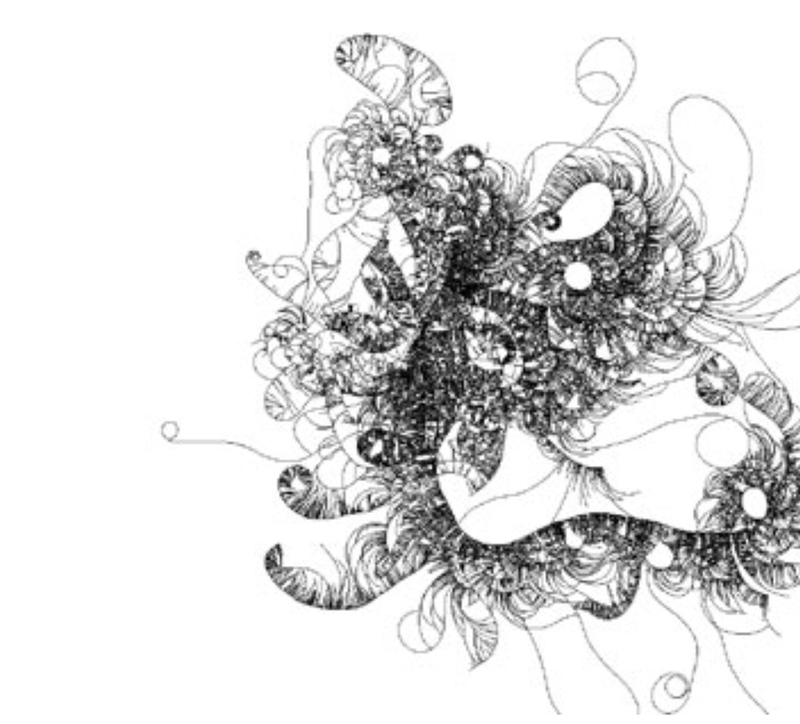 In Niche Constructions, line-drawing agents move over a virtual canvas, leaving a trail of ink as they move. While drawing, they might reproduce, giving birth to new lines with similar drawing behaviour. If an agent intersects with an existing line, it dies. Eventually, all species become extinct; the drawing space fills up, all the agents die off, and the drawing is complete. Each agent’s genetic structure contains a special gene that represents the optimum image density the each individual and its descendants. The value of this optimum is genetically determined, but can vary between different species of agent. As the agent moves around the canvas, the density of ink is measured in a small area surrounding the agent’s current position. This density measure is used to determine how suited the environment is to the agent’s density preference. The closer the match, the more successful the agent is in terms of longevity and reproduction. Over the life of the drawing, the agents modify the environment to suit their niche preference. Additionally, through evolution, the genetically determined density preference adapts as the drawing fills with lines and becomes more dense. The niche construction drawings show much greater variation in density and drawing style than the drawings made by agents without this mechanism. Niche construction introduces more complex behavioural dynamics into the drawing process using a relatively simple mechanism. ‘Founder’ agents often draw large, closed boundaries to protect their low-density children from being invaded by high-density loving invaders, for example. We often think of creativity as a complex cognitive function that is most developed in humans. Niche Constructions shows how the bottom-up interaction of many simple, low-level processes can result in a system that exhibits creative behaviour.